My immune system is trying to keep me from getting healthy. This happens to a lot of people, usually through allergies, but in my case it’s more complex: every time I start a good, solid, regular workout routine it intervenes with an illness. This week it’s a cold, my 45th since winter began. I guess they figure that if I get too healthy they won’t have anything to do, but still, I never thought making myself healthier would make me sick. The best I can manage at this stage is to rest, take my vitamins and watch someone else doing exercise – which is how, on one recent and very web browser-y morning, I stumbled onto the greatest athletic event of 1988. No, it wasn’t the Summer Games in Seoul, and it wasn’t the Winter Games in Calgary. It certainly wasn’t the Super Bowl – that was the year Doug Williams and Washington blew out John Elway’s Broncos, 42-10, a one-sided end to an unhappy, strike-shortened season. Yes, 1988 was the year Kirk Gibson and Orel Hershiser led the LA Dodgers to an improbable win over the A’s in the World Series, the real drama that year was in the National League Championship Series, where Hershisher almost single-handedly beat the New York Mets; the final series, at four games to one, was actually nearly as one-sided as the Super Bowl. The greatest athletic event of the year, then? 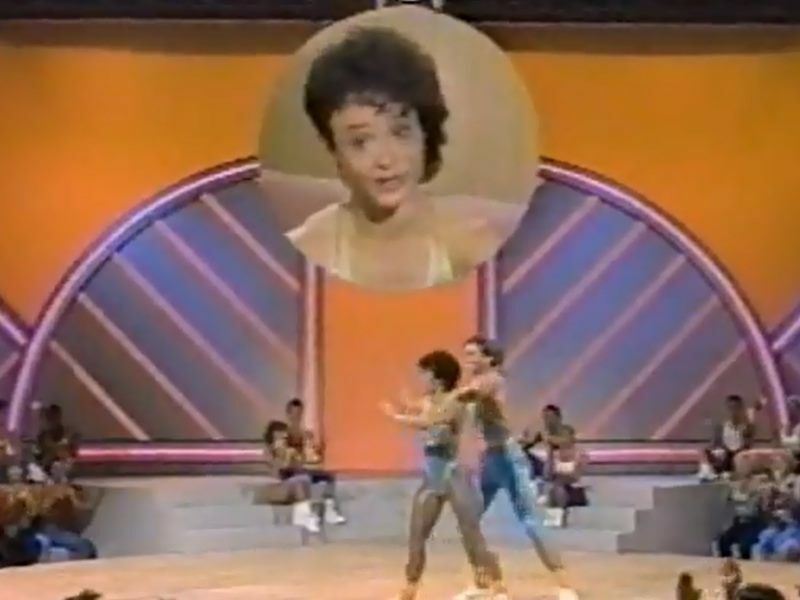 The 1988 Crystal Light National Aerobic Championship, of course. It’s important to remember just how big aerobics were in the 80’s. Dr. Kenneth Cooper first popularized enhancing cardiovascular health through aerobics in his aptly-titled 1968 book Aerobics, but it didn’t achieve “craze” status until the early 80’s, thanks in part to some star power: Jane Fonda led the high-intensity charge, but Richard Simmons was a pretty potent, albeit short-shorted, cultural force, too. The rise of aerobics dovetails with the rise in home video; people who would never have felt comfortable huffing and puffing in a class could have a private class with Body By Jake, or Denise Austin, or… these people. There’s a lot I don’t get about that particular video, but I especially don’t get that there’s graffiti on the interior walls of the workout room. “Arnold was here?” You mean like Gary Coleman? Arnold Drummond aside, though, kids were supposed to ride the fitness wave too. The Disney Channel presented Mousercise, starring Kellyn Plasschaert and a headband that did not mess around. I remember watching the Mousercise video multiple times, though never once actually doing the exercises. Probably not what they were aiming for. But then school had me hooked onto a bigger fitness icon than even Minnie Mouse: President Ronald Reagan. In fourth grade I worked very hard to achieve the “eagle” patch given out by the President’s Council on Physical Fitness; I was robbed of a repeat in fifth grade, I was simply getting too tall to be considered flexible and my athletic heyday was over. I moved directly to snark, for which there was no President’s Council but plenty of targets on which to practice. Aerobics weren’t designed to be competitive in the usual sense, so I’m fuzzy about the how and why of an aerobics competition. Participants in an aerobics class aim to follow the leader as best as they can. The goal is to fit in, not stand out, which kind of defeats the point of choosing a winner. Besides, aren’t we all winners when we work out? The crushing weight of logic notwithstanding, the National Aerobic Championship had made it to its fourth annual event in 1988, which is pretty impressive by 80’s standards. I mean, the USFL didn’t make it that far. Neither did the Alice spinoff “Flo,” for that matter (though I blame that solely on network infighting – they watered down all the kissing of grits and it backfired). It was most likely that longevity that convinced execs at local TV stations across the country to preempt many movies of the week to bring us a special presentation. And having watched many made-for-TV movies in my time, I can say without any doubt that this was better than almost any of ’em. Also: the leotards leave little to the imagination – and with these closeups we’re seeing just how little. You’d think wearing something this tight would restrict blood flow, but not for some of these dudes. We’ve five minutes in and this show could go off the rails with all the spandex and anatomy flying in our faces. We need someone to bring this ship back down to earth. 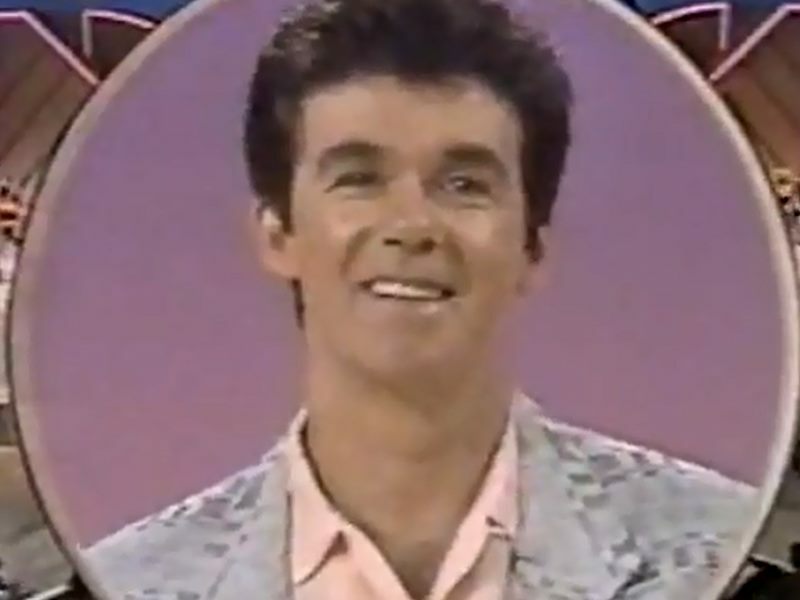 And with that, let’s introduce our host… Alan Thicke! The star of the hit TV sitcom “Growing Pains” was “honorary chair of the National Fitness Foundation,” but his real purpose for being here is to keep the mood light, so that the audience doesn’t end up hating these athletes for being better than everyone else. He opens with a jokey monologue about how the first such competition was set up centuries ago “by the Greek fitness instructor, Aerobicus.” He tweaks the audience, but only a little: “how many people here only exercise caution?” You don’t want to hit him because he almost always stays on the right side of the smarmy guy-regular guy continuum. And because without him, you’re just watching other people doing aerobics for an hour. Thicke is flanked by “fitness expert and star of TV’s workout show, ‘It Figures,’ Charlene Prickett,” and “two-time Olympic medalist and international sportscaster Dwight Stones.” The show is downplaying that Stones’ two medals in Olympic high jump are bronze, which is a little passive-aggressive. How many medals does the voiceover guy have? 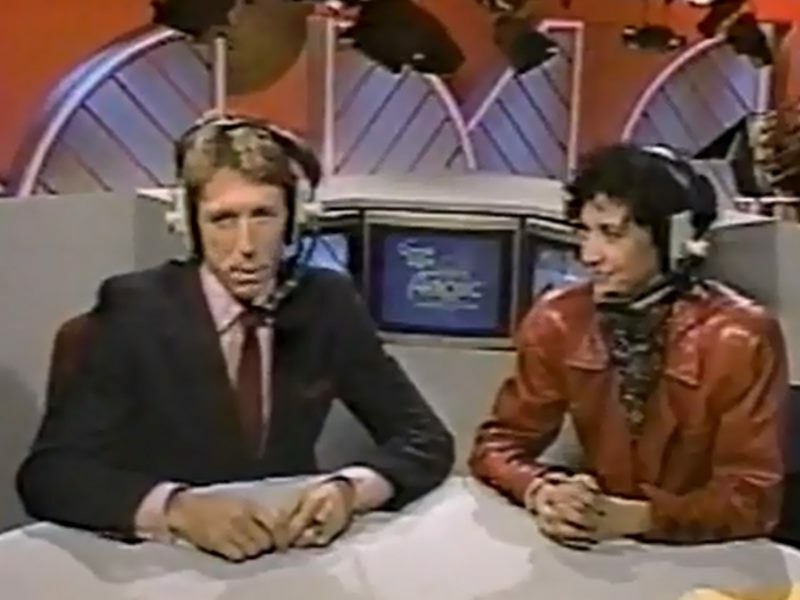 Then again, Stones himself downplayed aerobics in a Sports Illustrated feature on the competition: “When Stones was asked if he would ever participate in aerobics, he replied: ‘No, it’s not going to help me to jump higher. '” Ouch. There are four events – pairs, teams of three, solo men, solo women – and in each case, competitors have to do a 1 minute, 45 second routine. As long as you include a few pushups, situps, leg kicks and jumping jacks, you can do what you want. Presentation counts almost as much as technical excellence, which is a shame because it’s the 80’s. I’m afraid of aerobics, I don’t like crowds and I really clam up when I’m on television. Why am I here again? As each new routine begins we hear from the competitors about why they’re here and what competitive aerobics means to them. Most of the athletes share somewhat generic platitudes about wanting to be their best and how much they train to compete at this level. The first entrants in the pairs competition, on the other hand? They both point out how nervous they get performing. Which is awkward and a little funny and completely untrue, because they actually do just fine. The big highlight of their routine is a series of tandem one-armed pushups, which Charlene says will “make them really hard to beat.” The second team is not saddled with stage fright, but they are saddled with painful post-disco backing music, plus they’re way out of sync on their (two handed) pushups. Team three nails their pushups and what Charlene calls their “high energy and… sincerity!” They clearly win over the fans and, then, the judges, which earns them medals, flowers and spots on the 1988 Crystal Light aerobics team, which I figure means a year of living in a van and performing at grade school assemblies, fueled on nothing but low-calorie lemonade and occasional leftovers from secondary TV sponsor El Pollo Loco. There are like 455 judges, by the way. “It’s not easy being a judge,” Thicke tells us as he announces the mixed pairs winners. “Remember Bork and Ginsburg?” A Supreme Court joke? On an aerobics show? You couldn’t do that today. “Hannah Kearney is really sticking to the middle of this ski course – she’s like the Sandra Day O’Connor of skiers.” Hearing Robert Bork’s name reminds me of the kerfuffle during his time as a Supreme Court nominee, when reporters found his video rental history and published it. Sadly, there were no workout videos on there. The team competition is next – first up is three dudes in zebra-print Zubaz, and if that wasn’t 80’s enough they’re also performing to a sped-up version of Yello’s “Oh Yeah.” Dwight notes, “this team is well synchronized.” Team two hails from “Bodyrock Houston” – two women and a guy who win accolades for doing the shimmy move Pat Benatar and her entourage do at the end of the video for “Love is a Battlefield,” and for LASER sound effects at the end of the performance. Team three is all women; as a result the team competition has a very slight gender imbalance, which is what I guess I would expect given that I remember this craze being very heavily marketed toward women. This says plenty about how socialization can affect a woman’s body image – or a man’s sense of masculinity. Remember those little video comments at the start of each routine? The Zubaz guys each come off just a tiny bit defensive in their videos; they all point out how competitive aerobics requires strength as well as agility, that it takes discipline to perform at a high level just as in any other sport. The subtext is clear: don’t read anything into the leotards. Charlene and Dwight note that so many men are doing aerobics now that the individual competition is now gender-specific instead of unisex. Oh darling, I work my body out just for you. It’s dripping with so much workout-themed innuendo I’m afraid Alan Thicke is going to slip and injure himself. He’s following in the footsteps of Olivia Newton-John, who took the edge off “Let’s Get Physical” by setting the video in a workout center. Thicke isn’t quite on Olivia’s level, but he’s not a bad singer by any means; the man could’ve been his generation’s David Hasselhoff. The individual finals are heavy on 80’s fashion and style: the first woman soloist, Melanie, rocks a midriff and leg warmers. Her opponent, Rosie, makes me slightly dizzy with her windmill arm moves, a thrilling series undercut only slightly by a moment when she grabs her own hinder. The judges overlook this and give Rosie the title. Dude number one, Peter, twirls his body and his adult film mustache at nearly the speed of light, only to slow down for the smarmiest-looking sit-ups I’ve ever seen. His opponent, Kim, is wearing suspenders without a shirt and pants with fringe, which is slightly less frightening than Peter’s pushups and so he is victorious. 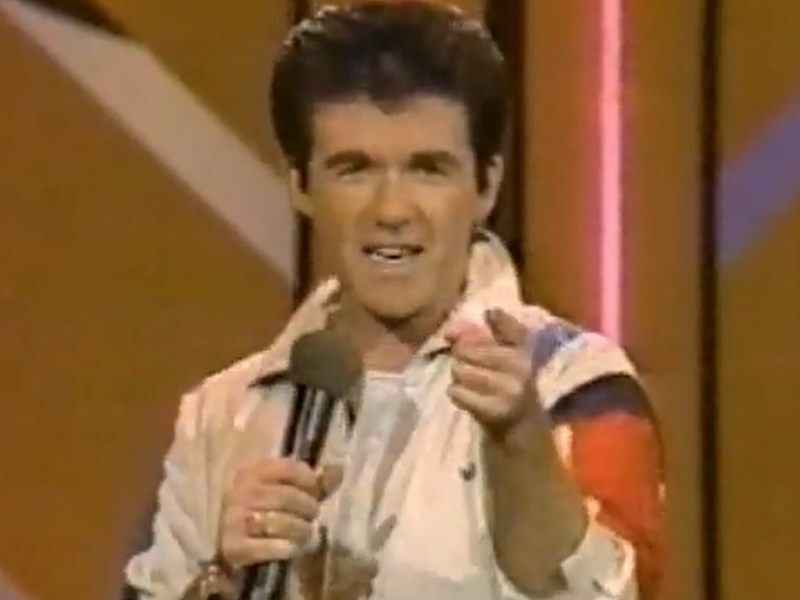 And that’s pretty much it – Alan Thicke congratulates the winners, reminds us that they’ll lead Crystal Light’s touring aerobics team for the rest of the year, and concludes by saying “somewhere out there, there’s a sit up with your name on it.” Um, ok. As the credits roll the athletes re-do the dance number from the start of the show. So we’re full circle, I guess. Which is appropriate in a way, because the following year’s competition was a sign that the bloom may have been off the competitive aerobics rose – the leotards and the self-congratulatory theme song were back in 1989, but there was no Alan Thicke, no Crystal Light, no Dwight Stones; just Charlene Prickett and a fellow called Chris Marlowe, who used this aerobics gig to eventually serve as the voice of the NBA’s Denver Nuggets. That’s not to say, of course, that you couldn’t bring this whole scene back today – it’s not that different from what “Dancing With The Stars” and these other shows do, and there are still aerobics competitions today; they’re known now as “sportaerobics,” a slicker name than “competitive aerobics” and one that’s easier to distinguish from, say, “competitive eating.” If nothing else, bringing the competition back to television would give Alan Thicke the chance to outdo his R&B star son Robin and sing another suggestive number about muscles and sweating and pumping and so forth. Or maybe I just need to find a way to workout without getting sick? Maybe I’ll start with the flexibility. I still want that second presidential fitness patch. Do you happen to know, where I can find this song “We Are The Winners – Watch Us Glimmer”? It’s supposedly opening from 1988 show. Ha ha ha ha. Laugh at the athletes in the funny costumes. Basketball shorts looked pretty ridiculous in the 80s if you remember, as do Olympic wrestler’s unitards. I did these competitions from 1986 – 1988 and Crystal Light was dropped because REEBOK picked it up. There were the National Aerobic Championships in which winners from regional competitions faced each other in finals. The winners toured the world and the next season they were at every regional competition. After just a few years there were the World Championships, where national winners from all over the world competed against each other. I challenge any one of you people laughing at how silly they look to keep up with them or actually DO anything we did. The producers of the competition went on to produce America’s Best Dance Crew, so basically, you’re wrong about everything. what is Alan Thicke like in person? He didn’t talk to the competitors much so I don’t have much of an impression. I was never a “champion” or a finalist when he was hosting. After Reebok became the sponsor, he wasn’t there any more. After Reebok left as a sponsor the free shoes went away, and the “prizes” declined in value. Last I competed was in 1995 and you even had to pay your own airfare to finals, where before all of that was covered. The producers of the whole thing created America’s Best Dance Crew, which is a similar sort of competition.